Sunday, March 22 was World Water Day. The environment editor of the Sunday Herald Rob Edwards did a decent report on the growing water crisis around the world which includes interviews with my friends Tommy Kane and Kyle Mitchell, two of the world’s leading experts on water. However, the article did not emphasize how privatization is exacerbating the crisis. 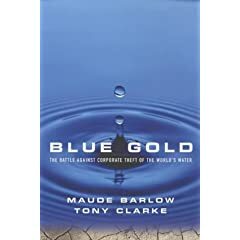 Here I produce in full warnings from both Tommy and Kyle, who later today will also be introducing the Scottish premiere of the award-winning film Blue Gold: World Water Wars at 7pm in Strathclyde University’s McCance Building, Lecture Theatre 1. (There will be a wine reception to follow.) The event is open to all, so if you are in the vicinity do drop by. In Scotland despite – or possibly because of – the overwhelming rejection of water privatisation at the now famous Strathclyde referendum there has been a concerted, clever and tacit campaign by legislators, regulators, think tanks and businesses to turn Scottish Water into a private company in all but name. By changing its corporate structure, outsourcing contracts to private companies and tapping into the Private Finance Initiative a public sector body has been almost overwhelmingly commercialised. Worryingly, these changes are conducive to a future private ownership structure.